A minute-by-minute account of what just transpired. Pete Mitchell muted CNN at the Embassy Suites in downtown Orlando and trudged onto the stage overlooking a hushed ballroom, where the dour remnants of an audience gathered to celebrate Bill Nelson's reelection to the U.S. Senate on Election Day now waited instead for some kind of solace or finality. It was after midnight, and Nelson didn't have much to say. But somebody had to say something. About 20 minutes earlier and 200 miles away in Naples, Gov. Rick Scott had declared victory, announcing his ascension to the U.S. Senate after leading the incumbent by more than 57,000 votes. On the other side of Orlando, Trump-endorsed Ron DeSantis was celebrating his own win in the race for governor after receiving a concession call from Tallahassee Mayor Andrew Gillum. "Thanks for your patience," Mitchell, Nelson's longtime campaign manager and chief of staff, told a smattering of reporters and supporters. "Based on numerous media reports, the Senate race has been called for Rick Scott. This is obviously not the results Senator Nelson's campaign had worked so hard for." Mitchell said Nelson would have more to say in the morning, and despite his characterizations the press was treating the race as too close to call. But the statement felt like the period on another declaration of Republican dominance in Florida, where the ruling party once again held on to the governor's mansion and also appeared to topple Nelson, the last standing statewide elected Democrat. The results were tight, but that's Florida. And in an election with more than 8 million ballots cast, Republicans had apparently eked out a clean sweep of the state's top two races and the entire cabinet. "This campaign is behind us," Scott said at his LaPlaya Beach & Golf Resort victory party, where chants of "Senator Scott!" rang out. "That's where we're going to leave it." As election night faded into the morning after, hundreds of employees and volunteers were still running thousands of paper ballots through tabulation machines and counting votes in windowless warehouses in Lauderhill and Riviera Beach. Unbeknownst to the candidates, more than 100,000 late-arriving absentee ballots and outdated equipment had gummed up the vote counting in heavily Democratic Broward and Palm Beach counties. While everyone focused on the fact that election-day votes had almost all been counted, a deluge of mail ballots and early votes was still working its way into the system. Controversial Broward elections chief Brenda Snipes — who on election night told reporters that "we're not as slow as we used to be" after struggling to handle late-arriving absentee ballots during the primaries — was once again struggling to count late-arriving absentee ballots. And she'd stopped making regular reports to the state on her progress. It was somewhere around 3:15 a.m. on Nov. 7 when thousands of new vote totals updated into the state's system, according to Nelson's campaign. The Senator finally had something to say: "We are proceeding to a recount." Droves of attorneys descended on Florida courtrooms and canvassing boards, thousands of volunteers gathered to handle ballots in latex gloves and dozens of protestors scrawled signs and set up camp outside elections headquarters. Machines and processes broke down. Ballots were lost. Deadlines were blown. And a federal judge declared Florida the "laughing stock of the world." Despite the victory speeches, savvy political observers never believed the Florida midterms were over. Back in Tallahassee, it was barely 9 p.m. on election night when Democratic consultant Steve Schale looked up from his tablet amid a rain storm and told a New York Times reporter that it would be at least another 10 days before the U.S. Senate race could be called. In Miami Beach, agriculture commissioner candidate Nicole "Nikki" Fried gathered her team within the hour in her suite at the Fontainebleau to prepare for what looked like a looming manual recount against Republican state Rep. Matt Caldwell, who declared victory that night while clinging to a lead of a few thousand votes. In Orlando, after leaving the stage, Nelson's longtime chief of staff was surprised when his statement was treated by some as a concession. The campaign released a statement at 1:09 a.m. explaining that they were waiting for every vote to be counted. Within a few hours, they'd retained the services of Marc Elias, general counsel for Hillary Clinton's 2016 presidential campaign and a recount veteran. To help pay the bills, the Florida Democratic Party sent out the word that they needed six figures in donations to get the recount team going. Scott's campaign responded by calling Nelson "desperate." But they knew the recount was coming. Florida laws put into place after the disastrous 2000 presidential election require races within one half of one percentage point to endure a second tabulation of all the votes. And just like Nelson, Scott's team was coordinating with attorneys and campaign staffers in order to make it through another two weeks. He'd raise $1.4 million over the following week to pay for the overtime resources. Continued returns in Broward County were fueling the shrinking race margins. The morning after polls closed, Schale pointed out that Broward's website seemed to point to 30,000 as-yet tallied votes in Florida's Democratic bastion. As that number shrank, so too did DeSantis' lead, which unlike Scott's had grown to the point that the Associated Press had called the race. By that evening, nearly 24 hours after he fell behind by 75,000 votes and more than a point, Gillum was on a conference call listening to his campaign staff discuss the fact that he'd probably conceded too quickly. "This campaign has had no shortage of random stories, and of course it's going to have a recount," said a person familiar with the conversations. "It just felt like a fait accompli." Congressman Matt Gaetz, a member of DeSantis' transition team, got a call from Donald Trump's campaign manager telling him to head to Broward County, according to the Washington Post. Elias, Nelson's newly hired attorney, jumped on a conference call with reporters and explaining how he believed Nelson would pull out a victory. In Broward and Palm Beach, thousands of ballots were still uncounted. At the same time, thousands more traditionally Democratic-leaning provisional ballots were unresolved. And the biggest key of all: some 30,000 "undervotes" in Broward County — a remarkable 4 percent of the vote. Elias believed voters had made a choice in the U.S. Senate race in those ballots, but a machine error had left them uncounted. With Scott's lead already down to only 22,000 votes, it suddenly wasn't impossible that Nelson could actually win. "That undervote doesn't make any sense," Elias said of the number of people skipping the first race on the ballot. "And it doesn't make any sense that it's a ballot design issue." As Elias spoke to reporters, Snipes and other elections supervisors were talking to Secretary of State Ken Detzner, who oversees Florida's elections. Detzner told them on his own conference call that Florida was headed for multiple statewide recounts. "The recounts will be nationally watched … [we're] under a microscope," Detzner said. Snipes emerged from the call to speak in a hallway with attorneys for the Democratic and Republican parties, who by this point were concerned about a dearth of information coming out of her office. Scott's campaign was growing furious with her lack of response to their request for basic information. How many votes were left to count? Snipes either couldn't or wouldn't say. Shortly after, Snipes — who outside of Palm Beach County's Susan Bucher was by this point the only elections supervisor still tallying mail-in ballots — addressed reporters. "Whatever is back there, we have to finish it today," she said. A few minutes later, she updated her totals again. And suddenly Fried was ahead of Caldwell. Having gone to sleep on election night facing a complete wipeout at the polls, Democrats were suddenly optimistic. Gillum released a statement explaining that he'd prematurely conceded and began a count-every-vote tour that would take him from churches in Fort Lauderdale back to Tallahassee. Democratic activists began hunting for voters with provisional ballots to convince them to fix any problems and get their votes counted. Meanwhile, Republican patience was wearing thin. U.S. Sen. Marco Rubio, a Florida Republican with whom Nelson had a warm relationship, began tweeting that Snipes' "incompetence" had opened the door for Democratic attorneys to "steal" the election. Scott's attorneys drafted two lawsuits, one against Snipes for refusing to turn over public information and another against Bucher for conducting activities in private, like duplicating damaged ballots, that by law are supposed to be conducted in the open. 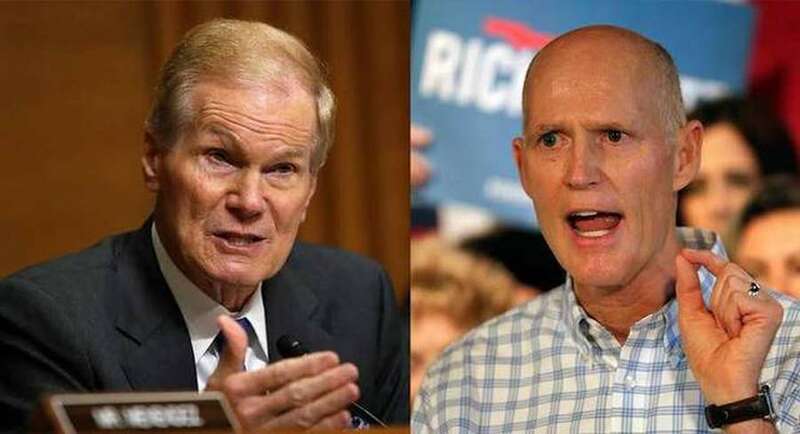 Scott announced the lawsuits with an evening press conference in front of the governor's mansion, during which he claimed there was "rampant voter fraud" in South Florida and requested an investigation by state police. "We've all seen the incompetence and irregularities in vote tabulations in Broward and Palm Beach for years. Well, here we go again," said Scott, who fielded no questions and immediately went on Sean Hannity's show on FOX. "I will not sit idly by while unethical liberals try to steal this election from the great people of Florida." Scott had kicked a bee hive. Within minutes, President Donald Trump was tweeting about voter fraud, and Republican campaigns were organizing protests outside the offices of Snipes and Bucher. By Friday morning, Nov. 9, Congressman Gaetz was outside Snipes' office, where he rallied dozens of protesters in MAGA hats. They so unnerved Snipes' office that her staff called Lauderhill police to search members of the public with metal detector wands before allowing them to enter the building. In Palm Beach, when a crush of news cameras descended upon Bucher's office, she accused them of violating state laws banning the photography of ballot signatures and threatened them with arrest. As tensions rose, Scott was ripped for undermining the very elections he was tasked as governor with overseeing. His own elections departments and law enforcement arm said they had no credible allegations of fraud. But in court, Scott scored victories, with judges ordering Snipes and Bucher to turn over public information, provide more transparency and follow state elections laws. Bucher said she wouldn't be able to meet the court's deadline to turn over thousands of duplicate ballots made in private to replace damaged votes. The lawsuits — a new front on the extended campaign trail — were the first of many. Caldwell, the Republican agriculture commissioner candidate, sued Snipes, seeking a declaration that she not count mail-in ballots received after 7 p.m. on election night. At the same time, Nelson's campaign was suing Detzner in federal court over rules that resulted in the rejection of thousands of absentee and provisional ballots due to mismatched signatures, hoping to push back a Saturday deadline for the first set of unofficial results from elections supervisors. Nelson's extension request was shot down, and the Nov. 10 noon deadline to submit unofficial elections results passed showing DeSantis with a strong, 33,000 vote lead over Gillum and Scott clinging to a more precarious 12,500-vote advantage. Within a half hour, Detzner, the secretary of state, called for a mandatory statewide recount in the three races, launching efforts around the state to pore over 8.3 million ballots in just five days. By the time Detzner gave his order, the political war over Florida's recount was on, giving Floridians déjà vu. Democrats were accusing Republicans of voter suppression, pointing to scores of ballots discovered in an Opa-locka mail distribution center and thousands more rejected over the state's questionable voter signature laws. Gillum officially revoked his concession while DeSantis claimed victory (again). Meanwhile, Republicans from Donald Trump down to local activists warned of voter fraud. Pictures of elections boxes left behind at voter precincts and box trucks arriving at Snipes' office at night went viral on social media. "In the 2016 Election I was winning by so much in Florida that Broward County, which was very late with vote tabulation and probably getting ready to do a 'number,' couldn't do it because not enough people live in Broward for them to falsify a victory!" Trump tweeted. Snipes told reporters the following day that she was having trouble calibrating some of her machines, and explained that her staff hadn't yet started separating ballots. In Palm Beach, Bucher was quietly sweating. She knew that her equipment would struggle to handle the state-mandated load. She'd had more than a month to handle the slow flood of ballots. Now, she had five days. And worse, Bucher had to run more than 500,000 ballots at least three times each, since her machines weren't designed to recount three races simultaneously, not to mention an incredibly tight state House race hanging in the balance. In the coming days, Bucher would explain that her machines had overheated, invalidating the tabulations from 175,000 early votes and forcing her to go back through the ballots. A vendor later said that one of her workers had jammed a paper clip into a high-speed scanner, but Bucher said that was nonsense. What wasn't nonsense: it became clear that Palm Beach County couldn't meet the state's Thursday deadline for recount totals. "We're in prayer mode," Bucher would tell reporters ahead of the deadline. Snipes, meanwhile, was dogged by criticism. Even Jeb Bush, who appointed Snipes to her position in 2003, said she ought to be removed. As more information came out, Republicans began to question whether Snipes was allowing votes into her count that were invalid. Her staff separated more than 200 provisional ballots from their envelopes without consulting the canvassing boad, leading them to mix some two dozen invalid ballots with valid ones. On Nov. 11, Scott filed emergency motions in state court once again seeking the intervention of state police. Alleging that he couldn't trust Bucher and Snipes with hundreds of thousands of ballots, Scott requested that local sheriff's offices and the Florida Department of Law Enforcement be entrusted to impound vote tabulation machines and ballots during off times in the recount. At the same time, Attorney General Pam Bondi, among the names thrown out as possible replacements for the recently dispatched U.S. Attorney General Jeff Sessions, wrote a letter to FDLE Commissioner Rick Swearingen in which she expressed that she was "deeply troubled" by his decision not to investigate Snipes and Bucher. This time, Scott wouldn't get his court victories. A Broward judge said the next day there was no evidence of fraud, or any wrongdoing to merit the intervention of police in the recounting process. He urged both sides to "ramp down the rhetoric." But the campaign was fully in the hands of judges at this point, in particular one man who for years had been a thorn in Scott's side: Mark Walker. Walker, a federal judge in Tallahassee who months earlier had invalidated new clemency rules put into place under Scott, was suddenly overseeing lawsuits seeking to bar Scott from presiding over Florida's elections, invalidate the state's voter signature laws, strike down Florida's guidelines for determining "voter intent" on undervotes and overvotes, extend the state's machine and manual recount deadlines and count ballots that didn't make it to elections offices by Florida's election night deadline. While recounts have historically changed little in elections, the lawsuits before Walker sought to potentially alter the vote tallies in a way that could tilt the results for Nelson, and completely alter the state's recount rules. "Apparently I'm supposed to re-evaluate the entire election code of the state of Florida, one piece at a time. I've got it," Walker said during a five-hour hearing on Nov. 14, the day before a deadline to turn in recount totals. "This just seems like a really bad way to do this." With Scott in Washington for an event for newly elected senators, attorneys for both campaigns wrangled in front of Walker, who concluded the evening without a decision. Overnight, he handed Nelson a key victory. In the first of several crucial decisions, Walker said the state's laws disenfranchised voters whose ballots had been rejected without any ability to correct the problem. He stopped short of allowing all the rejected ballots into the system — comparing that to shooting squirrels with a bazooka — but gave voters until Saturday to file affidavits and have their votes counted. Around the same time, the state announced that it asked the federal government to investigate signature-cure affidavit forms that appeared to have been altered by the Florida Democratic Party in an attempt to convince voters to try to fix their signatures, even though a deadline had already passed, in the hopes of convincing the courts to open a second window. That investigation remains open. Within hours, Walker was back in his courtroom listening to new arguments in what would be a marathon Thursday on Nov. 15, Florida's deadline to submit machine recount totals. As the state's largest elections departments scrambled to finish their recounts, Walker handed Nelson two crushing defeats, rejecting requests to unveil the names of every voter with a rejected ballot and allow the deadline to pass. On the latter, Walker noted that there was no telling how long it would take Bucher — the focus of the extension — to complete her count. During the day, the supervisor testified it could be near Christmas by the time she was done. "You literally have blindfolded me, shoved me in a room, turned all the lights out and said, 'Judge, you're supposed to fashion a remedy,'" Walker said, later reserving choice words for the Legislature and state government in allowing the state's laws to continue to create muddled elections. "We have been the laughing stock of the world, election after election, and we chose not to fix this." As Walker admonished just about everyone in Florida from the confines of his courtroom, things were falling apart in South Florida. Bucher blew the recount deadline, as expected. Snipes, however, announced she'd made it — only to have a staff member explain that, actually, he'd fumbled the state's website and missed the deadline by two minutes. The error would fuel new conspiracy theories, since Broward's recount totals actually placed Nelson further behind Scott. But, it turned out that Scott's new advantage in Broward was due to Snipes' staff having lost more than 2,000 ballots, which she said were "misfiled." "The ballots are in the building," Snipes later insisted. As the manual recounts got started, Walker handed one final blow to Nelson in the early hours of Nov. 16, determining that the state's guidelines for determining whether voters meant to vote for one candidate or another on ballots rejected due to stray markings should stand. If Nelson's chances were fading, Gillum's were already gone. DeSantis' lead held in the machine recount, officially making him Florida's governor-elect. Gillum, though, didn't concede, fueling speculation that Democrats might try to contest the results of the election. But Nelson still had one more shot at gaining ground on Scott as the hand recount — the kind that inspired all those pictures with ballots and magnifying glasses in the 2000 presidential recount — began across the state. In particular, Nelson's campaign was looking at more than 60,000 ballots spit out by tabulation machines, about half of which were in Broward County. As the ordeal began days earlier, Elias, Nelson's campaign attorney, reasoned that machines had improperly rejected valid ballots, the bulk of which were going to go Nelson's way in a heavily Democratic county where he outscored Scott two to one. But, as hundreds of volunteers went over thousands of pages Friday, they made quick work of the recount. Furious Democrats blamed Snipes' ballot design, which tucked the U.S. Senate race into the bottom left-hand corner of the page below the instructions. Elias had insisted that the design was fine when he first spoke to reporters two days after the election, but by now, Nelson's campaign had come around as it became clear he would lose. The next day, Nov. 17., Gillum released a video conceding to DeSantis, signaling that there would be no election challenge from his campaign. Nelson knew it was over at that point. But his campaign waited until Sunday, the Nov. 18 deadline for the manual recount, to concede. He'd gained more than 2,500 votes on Scott in the recount, and nearly 50,000 votes in the days since Scott had declared himself the winner of the U.S. Senate race. But for all the money and effort, he hadn't changed the outcome. And, lest there be any lingering doubts of contested elections, Caldwell, who got burned worse than anyone in flurry of votes that came in after election day, conceded on Nov. 19, the day before the state's elections canvassing commission met and quickly certified the results of the election.. He called Fried to end the fight. But while the state certified the elections Tuesday morning, and the country will move on, Caldwell's concession also came with a warning that all is not well with Florida' elections process. He released a statement expressing the bewilderment of a candidate who watched his lead slip away amid confusion, incompetence and animus, and still doesn't quite know what happened. "Unfortunately, as a result of the abject failures in Broward and Palm Beach," Caldwell wrote, "it has become clear that we may never gain an understanding of what transpired in the hours and days after polls closed." Tampa Bay Times reporters Steve Contorno, Langston Taylor, Claire McNeill and Kirby Wilson, Herald/Times reporters Steve Bousquet, Samantha Gross, Elizabeth Koh and Lawrence Mower, McClatchy reporter Caitlin Ostroff and Miami Herald reporters Sarah Blaskey, Daniel Chang, Taylor Dolven, Glenn Garvin, Kyra Gurney, Douglas Hanks, Alex Harris, Maya Kaufman, Nicholas Nehamas Jimena Tavel, Carli Teproff and Martin Vassolo contributed to this report.